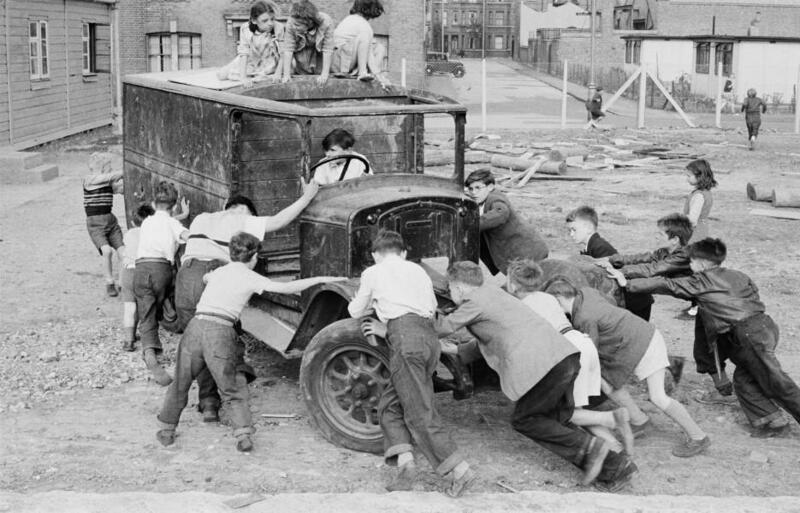 If you’ve spent any time on our site, or spoken to any of our team members you’ll know that we strongly believe in the power of play. It can bring so many benefits to children, and public play areas can bring together communities in a way that nothing else can. 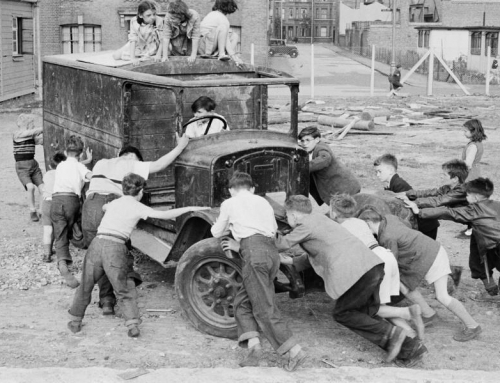 Only in public playgrounds can friendships can be forged, new skills horned and energy burnt off without destroying the house. Luckily we are not the only people who feel this way. 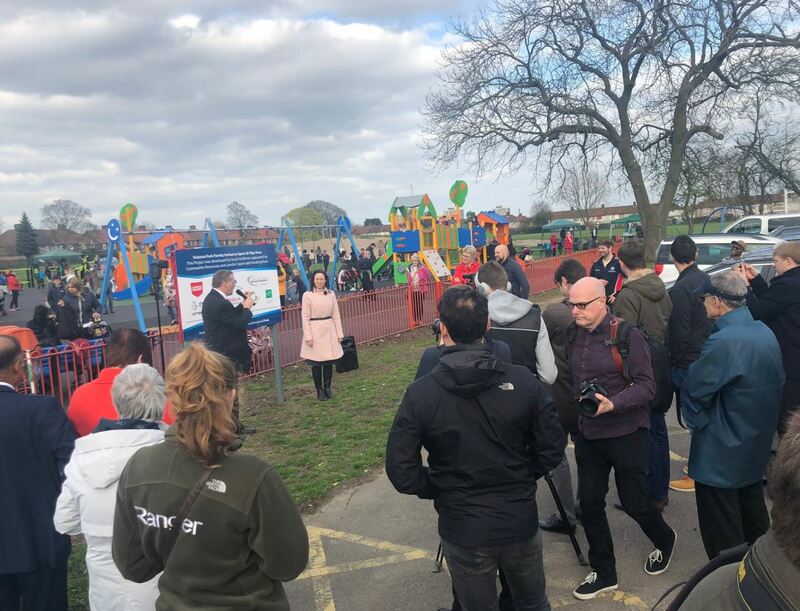 Lisa Adams from Dagenham knew that a safe play area was vital to her community – especially as parts of the local area suffered from deprivation and knife crime. As such, she sprang into action determined to help local children and families’ access better facilities. Valance Park was the nearest play area, though it was definitely in need of an upgrade. 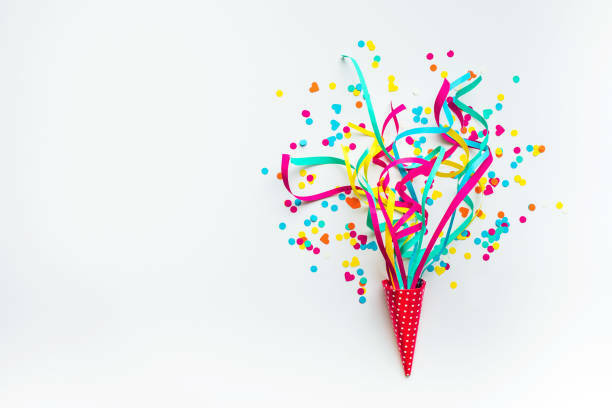 And so, by working with the council she managed to secure funding from three different grants, Barking and Dagenham Council, along with crowdfunding an additional £5,599 herself. 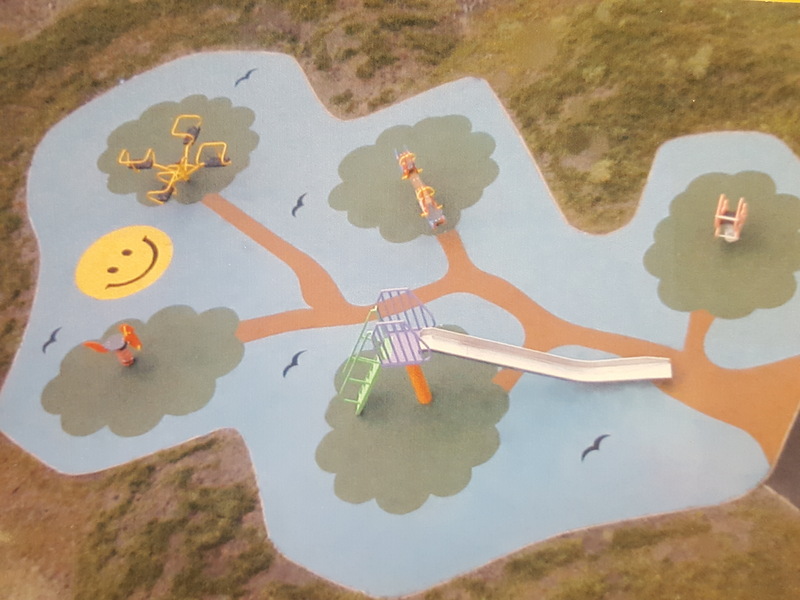 Following on from Lisa’s hard work, our team wanted to install the best surface they could for the new play equipment that was installed alongside a new fitness area. Working over five days they installed over 360m² of wet pour at various depths complete with wear pads and splash graphics. The grand opening for the new play area was a huge success with Lisa starring as the guest of honour! Another site we worked on also featured a fitness zone, this time in the shape of an outdoor gym made from recycled aerosol cans. 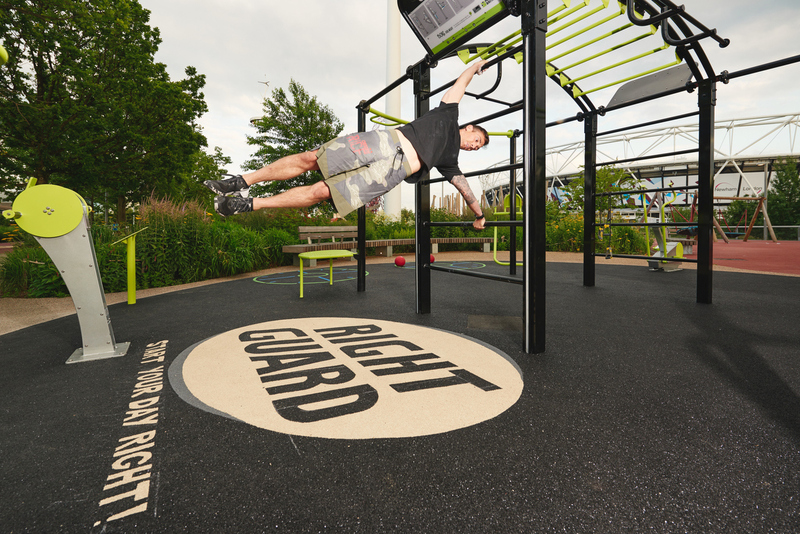 In a similar vein to London’s Olympic Park we were asked to install a bespoke design featuring the famous Right Guard logo. After spending only three days on site our team completed the install so the local residents were one step closer to a healthier life. We also installed a bespoke logo in Dover, for an indoor climbing centre. 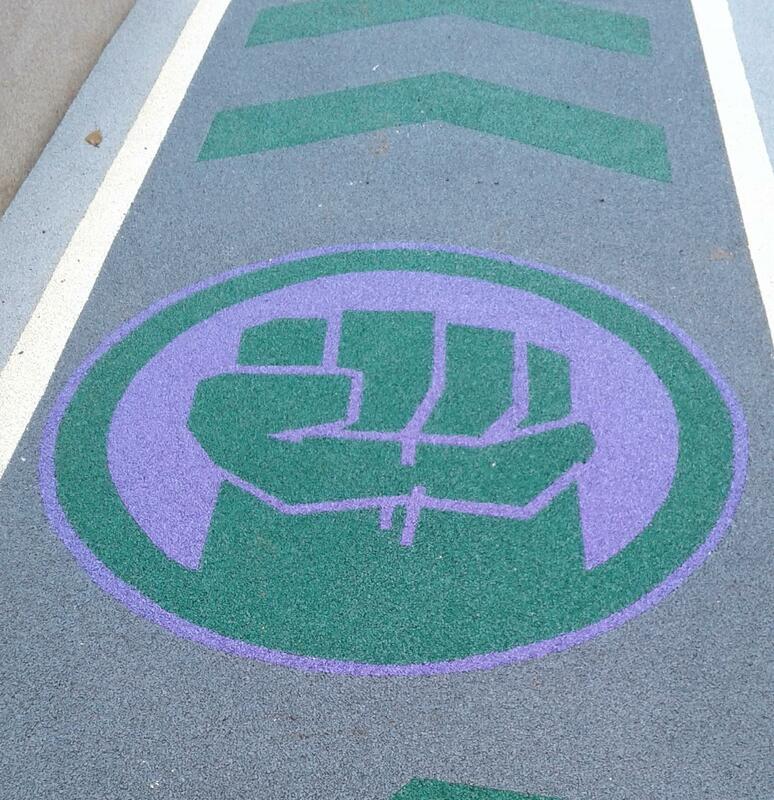 The customer’s logo was hand drawn, cut and laid within the wet pour safety surfacing by our site manager. All of our install teams receive in-house training to create bespoke graphics and many of our team leaders have over eight years of experience. Over the past 25 years we’ve installed everywhere from rooftops to inside shopping centres but as the majority of our work is outdoors, completing an indoor install was a nice change! One project we worked on that was definitely a change of scene was over in Equatorial Guinea. 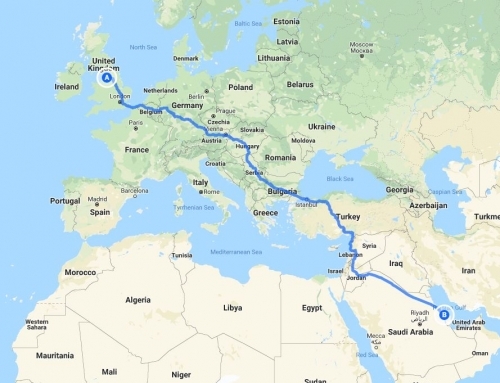 We have carried out work in Africa previously and this project gave some of our team members the chance to return. With our Operations team working tirelessly on everything from visas to deliveries to ensure the project ran smoothly, the install was completed and our team back home within nine days. 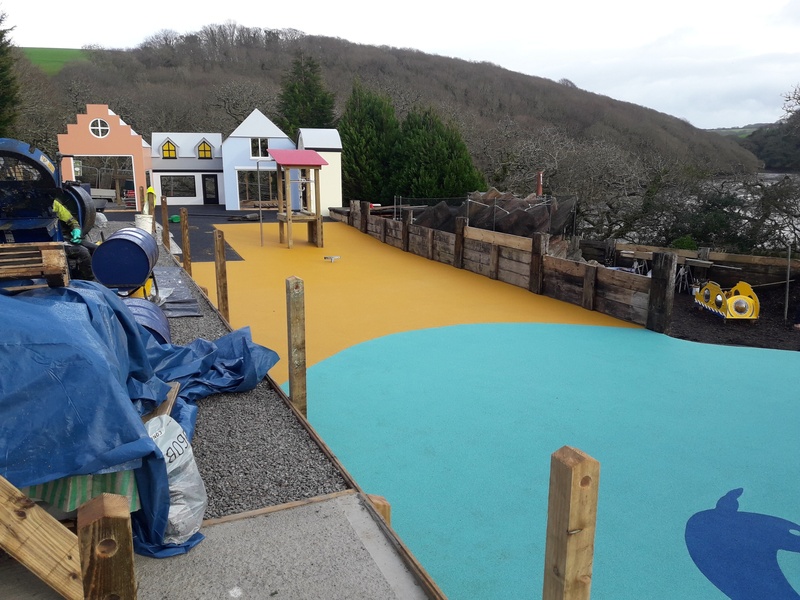 Overall the project included 250m² of 80mm wet pour in yellow and blue, with our team battling the heat to create a beach theme play area. As many people in Equatorial Guinea struggle with poverty, it’s great to think we helped create new resources for the local children and families. 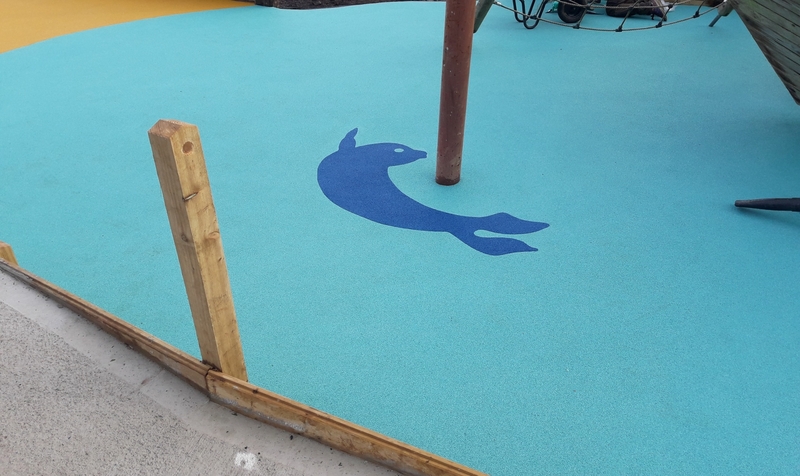 Closer to home we installed a new wet pour surface at Little Angel’s nursery in Preston. 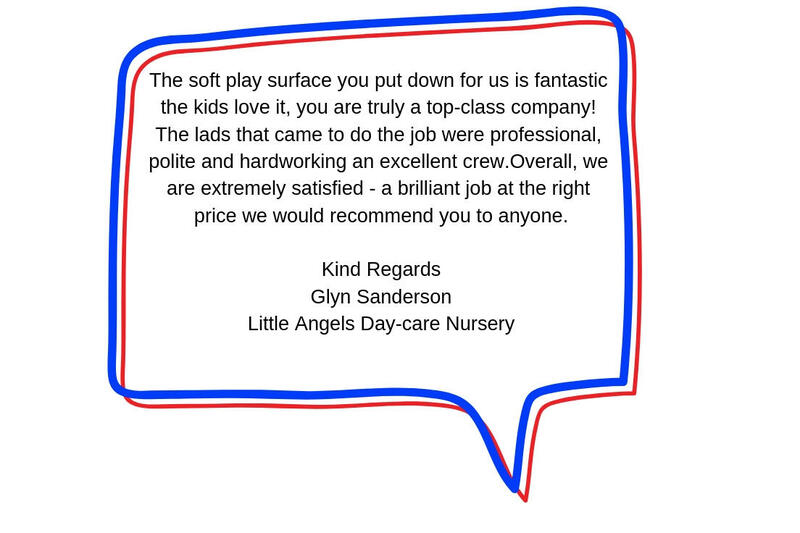 The project was completed within the day and afterward nursery staff took the time to send us a lovely email that really brightened our day. 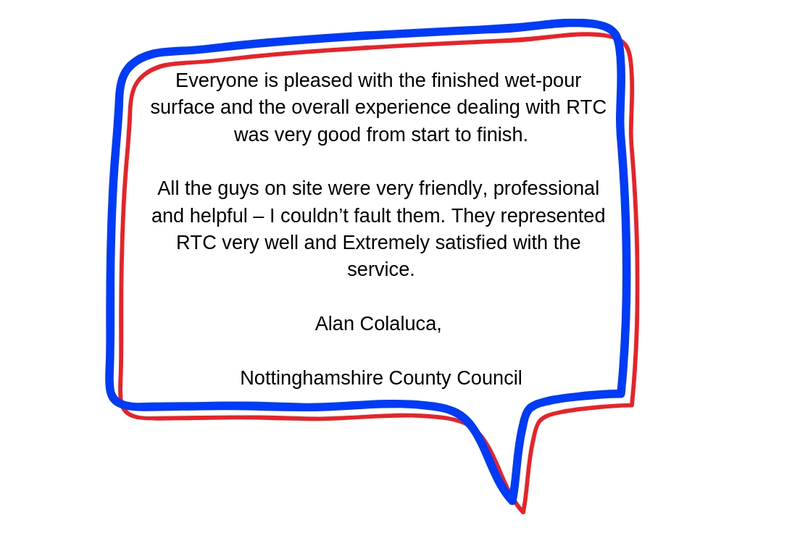 All of the team members who were involved in the project were thrilled to learn how happy the customer was. Another install we completed that was aimed at young learners was down in Cornwall. Youngsters that visit Gweek Seal Sanctuary to learn about wildlife will now be able to enjoy a new play area. Although a general design was agreed upon before our team arrived on site, our site manager worked with the customer on site to ensure all of the graphics exceeded their expectations. One of our other install teams was also busy working on another site, this time in West Thurrock. 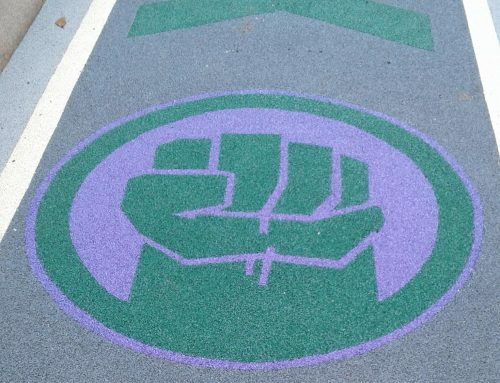 The eye-catching purple and orange decision was installed at Lakeside Shopping Centre. With the BBC reporting play areas can boost visitor numbers, we are sure it is going to prove very popular indeed! We’ve also been busy carrying out installs at a number of RAF sites on behalf of Proludic. 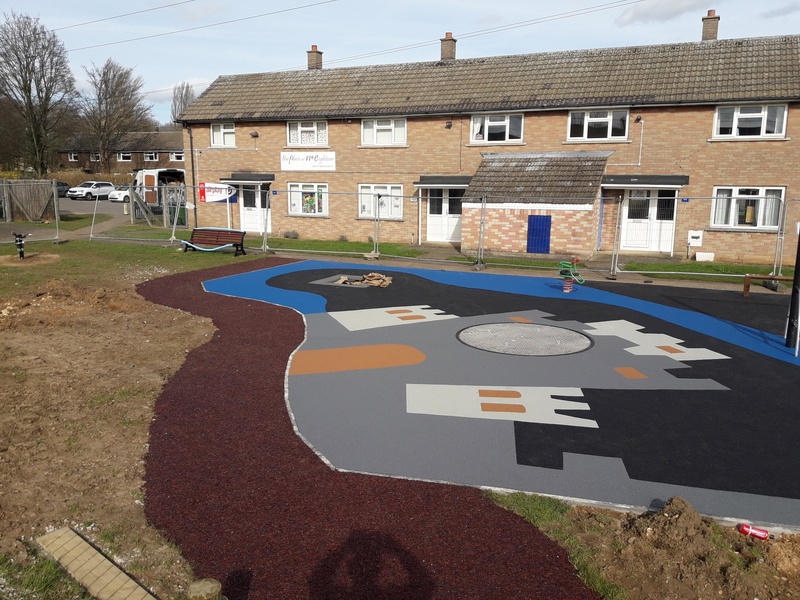 In Peterborough, we installed over 200m² of wet pour and mulch with graphics including a tower, river, and pathway. Over in Shropshire, the wet pour design featured vintage goggles and a parachute and a second site in Peterborough featuring fitness graphics. As ever, all of the graphics were hand laid by our teams and we think the end results look great! 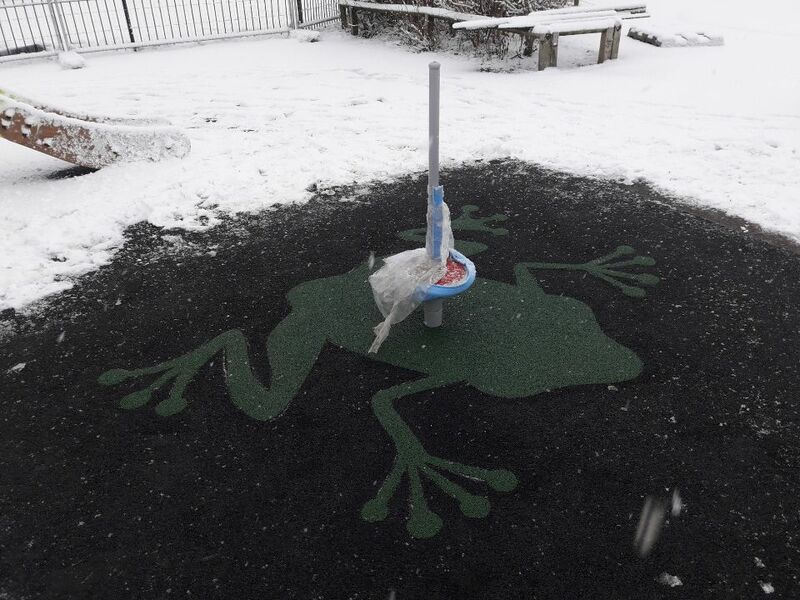 It was whilst we working for Proludic at a site in Cheltenham that the weather turned to the worst with snow covering many of the play areas we were working on. 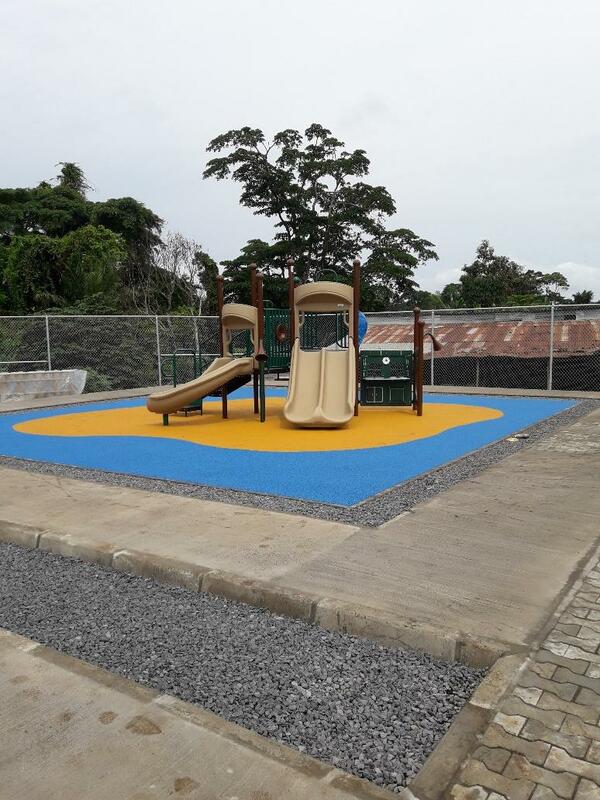 Thankfully as our site managers have years of experience and are used to working with the weather they were able to use their skills to ensure the playground surfacing was installed and completed on time. 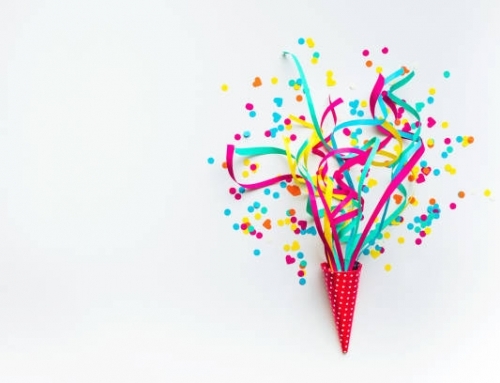 It’s certainly been a busy first quarter of the year, and it looks like there’s going to be no change in the coming months. If you’re working on a project and have a specific install date in mind, please don’t hesitate to get in touch for a quick quote!